There are many types of mosquito quotes and sayings, but there will always be a few of these phrases that stand out and stick with you. 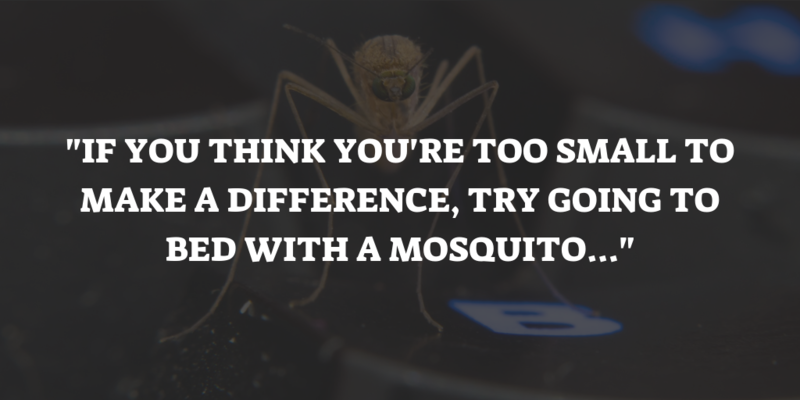 Because I know my readers love these types of posts, I decided to gather a few of the best quotes, sayings and general wisdom about mosquitoes. Some of these are funny, some have serious lesson inside of them. But all of the quote phrases I selected for you will give you a good brain tease. Let’s get started! Even if you think you’re insignificant in this vast and awesome universe, you can still make a difference to those around you. If you’re interested, I’d certainly read up on what is known as the butterfly effect. It’s a part of chaos theory that explains how the wings of a single butterfly can start a hurricane on the other side of the planet. It’s very similar to what this particular quote is trying to explain to us. Everything in the universe is connected. Even if you’re not aware of it, you matter. In more ways than you might think. Let’s move on to another one I really love: “It is not so much how busy you are, but why. 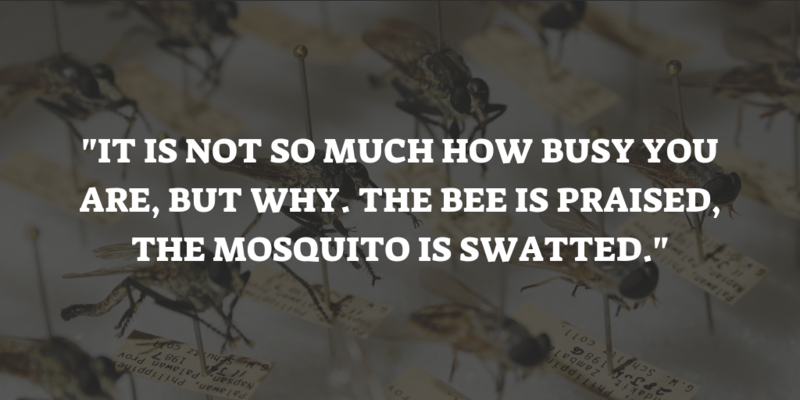 The bee is praised, the mosquito is swatted“. This is another great inspirational quote that can tickle your brain once you think about it for a bit. You see, we humans do so much in our lives, but you can certainly say not everyone is busy with the right thing. We all know that friend or relative that has taken a wrong turn in life. Certainly not judging them for it here, but the consequence will be very clear. Those who do good (the bees), will be thanked and praised in life. While those that do bad and only contribute to society in a negative way, will be faced with a hard and difficult life. Those are the people that will get swatted and hated. It’s kind of sad when you think about what the words really mean, but it does have some amount of truth to it, doesn’t it? The next one supposedly is an ancient proverb written down by Confucius, but it might as well have been said by Darth Vader or Donald Trump. I mean by that, don’t go after the source, but try to find the meaning in the words themselves. There’s a lot of different supposed sources on the internet for this particular phrase. Tracking it down to the real source would be near-impossible. 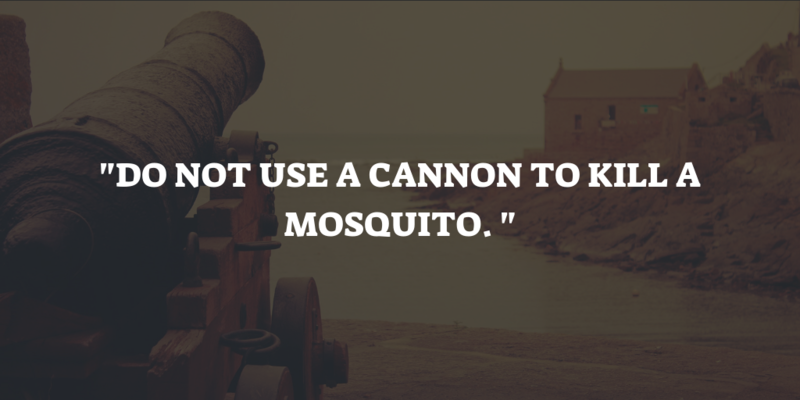 Anyway, the proverb goes like this: “Do not use a cannon to kill a mosquito“. A great saying, especially because of the underlying meaning of the words. It means that you should focus your resources correctly. If you shoot a cannon at a mosquito, it will die, but it might as well have been done with a newspaper. And the odds are also high you’re going to miss, because your choice of weapon is way off. Moving on the next one: “Do you want a mosquito blessing or an elephant blessing? Bigger blessings take longer to grow.” It’s one of those life-advice quotes that go after your personal patience for bigger rewards in life. Great advice, but it can be rehashed into many different ways. Nevertheless, it’s a great way of saying you should be thankful for what you are able to achieve in life. And work towards bigger goals as well. 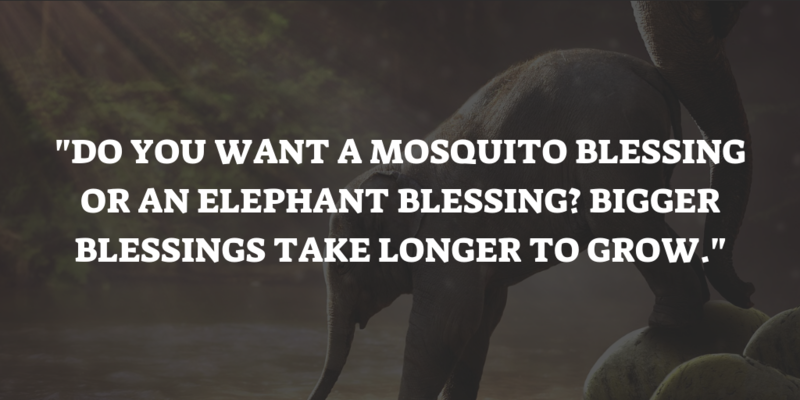 The comparison between the elephant and the mosquito in this particular quote is actually pretty classic: The imagery of an elephant as the biggest land animal on the planet, and the annoying mosquito that is so tiny you can barely see it at night. It will sting you, but the elephant will trample you. Which impact is bigger? That of the bigger animal, without a doubt. It’s the perfect way of sending across a message using animals as imagery. 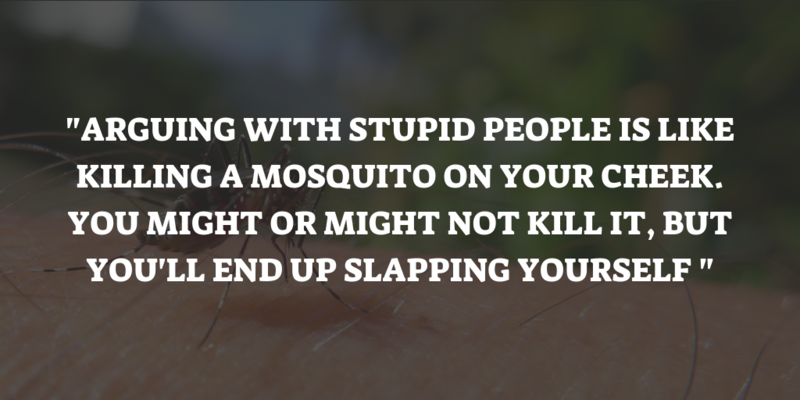 The next one is somewhat of a funny mosquito quote: “When you really want to slap someone, do it and say: Mosquito!” It’s a fun excuse to tease someone and give them a slap if they deserve it. But don’t actually hurt your friends, be nice to them. You can only do this in a joking manner, but make sure to play it safe. It’s one of those old practical jokes that gets used over and over again, but never gets old. 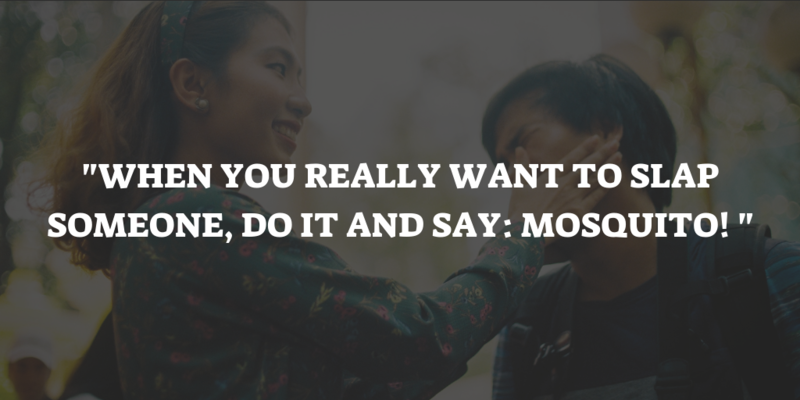 By saying there’s a mosquito on someone’s face, it looks like you want to help them. But actually, you’re just feeling like giving them a slap in the face, and there are no annoying insects on the other person to begin with. Oh, why am I even bothering explaining this, you get the joke I hope. Moving on. While we are in the funny mosquito quotes department, here’s another one for you: “Mosquitoes are like family: They are annoying, but they carry your blood.” It’s another joking way of saying some family members aren’t the most pleasant to be around, just like being around mosquitoes that buzz in your ear. Everyone knows someone who hasn’t got the most ‘fun’ family in the world, or that might be your personal situation. These phrases aren’t that far from reality, usually. But approaching it from the direction of a joke, it gets easier to deal with difficult family situations. You’ll be bound by blood for life, if you like it or not. Just like the mosquito that will thrive off of your blood for their own benefit, without your permission. It’s a clever comparison, and one that is easily remembered and used in the real world. Do you ever get some interactions or discussions with people back like a boomerang in your face? The same is true for this quote: “Arguing with stupid people is like killing a mosquito on your cheek. You might or might not kill it, but you’ll end up slapping yourself.” The rough translation of this saying is related to the fact that you should try and stand above dumb discussions. If you argue with people that are clearly being dumb or stupid, be it on the internet or in real life, you are literally wasting your time and making yourself look like a fool. Let’s avoid that in the future, is what this piece of knowledge is trying to say. Don’t punch yourself in the face over someone else’s stupidity. That about sums up the advice on this little bit of text! 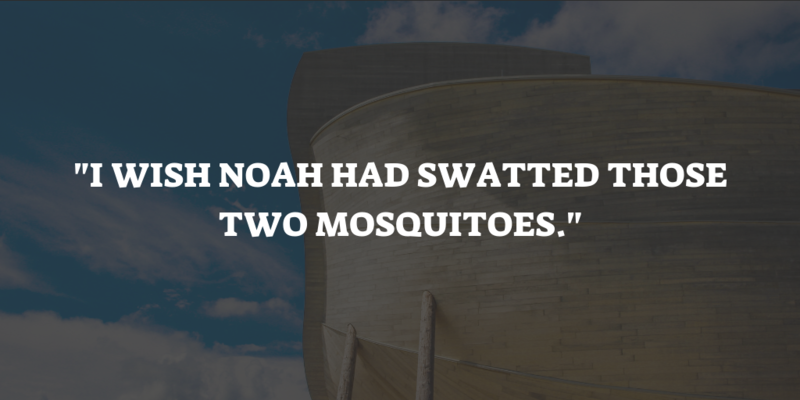 This last mosquito quote is short but powerful: “I wish Noah had swatted those two mosquitoes.” It’s a quote revolving around one of the more famous Biblical stories, Noah’s ark. The Biblical floods have destroyed Earth and God has given Noah the assignment to build a life vessel for all species on Earth: An ark. But why did he take insects and especially mosquitoes with him on that boat? Why didn’t he just swat them? It’s exposing a dilemma in this Bible story, since mosquitoes are clearly only alive to annoy people, right? Wrong, since mosquitoes actually have a lot of benefits. 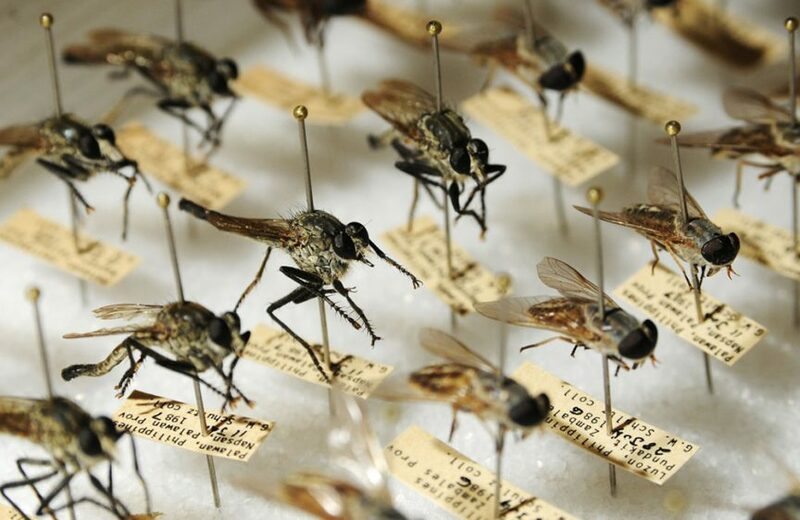 We are often unaware of these positive traits of our favorite insect on the planet, but it’s true that they serve a crucial purpose in the global ecosystem. So this quote about Noah is understandable from a human perspective, but ultimately unnecessary. 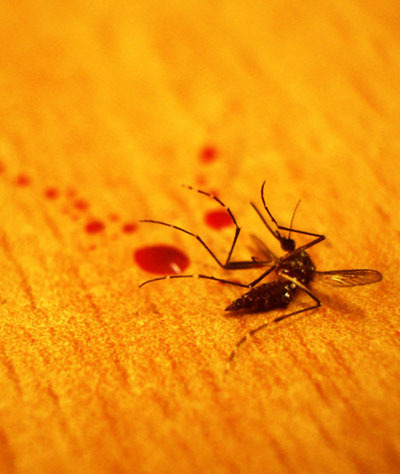 Which one of these hand-picked quotes about mosquitoes do you prefer? Let us know by sharing it with the other readers in the comments below this article. If you’ve gotten itchy around the topic of these blood-sucking insects, I do have a lot of other articles available on my blog that explain how to easily get rid of these pests in and around the house. If you’re really wanting to remove them from your life once and for all, I also have a very useful resources page, that will go over the most effective anti-mosquito products. These are all personally tested by me and reviewed for your reading pleasure. I’ve consciously chosen the most cost-effective solutions. So you’ll be sure to get a cheap solution to kill mosquitoes in and around your house. 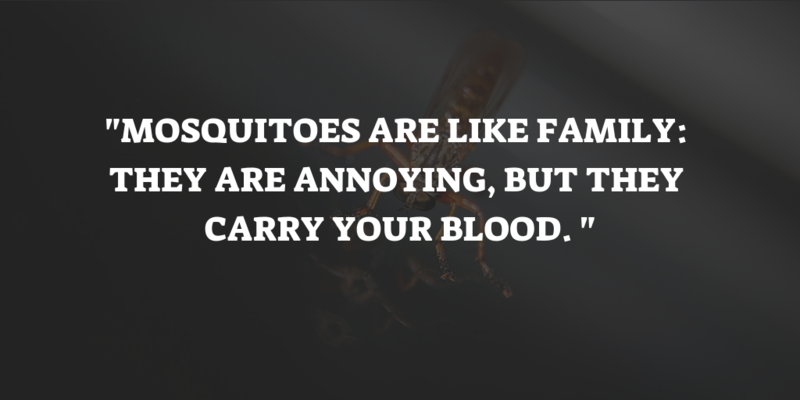 Happy hunting and make sure to share these quotes and sayings with your friends and family, the next time they start nagging about mosquito bites.